Gear Review: Heckler & Koch VP9, three years later is it still great? 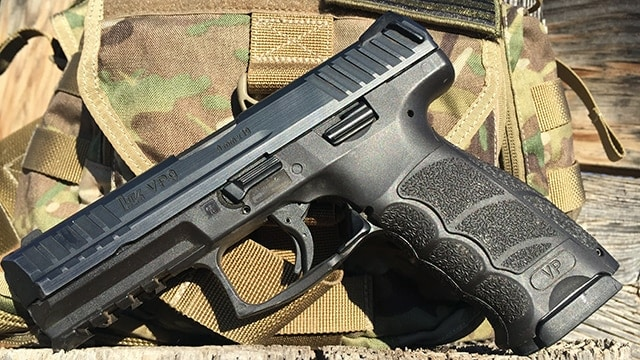 Back in June 2015, I did a write-up on my then-new Heckler & Koch VP9. Since then, that pistol’s logged several thousand rounds. A handful of friends and students have purchased their own VP9s and have spent many training hours on their copies. Also in this interim, the industry has become more competitive by offering lots of pistols that modern consumers demand, that is to say, with customizable features and simple operation. Has it stood the three-year test of time? In no particular order, here’s an update on the originally identified issues, plus an unforeseen wrinkle. The phosphorescent glow of the VP9’s solar-charged night sights is something to behold at the end of a sunny day. The rear sights glow so brightly, I’ve twice had the person next to me on the firing line comment on them. Notice I said rear sights. Since the front sight is buried in a holster most of the time, it doesn’t get the same charge. While it glows, it’s pale in comparison to the rear ones. As with most special features, it takes a little getting used to focusing on the less-luminous sight to make good hits. 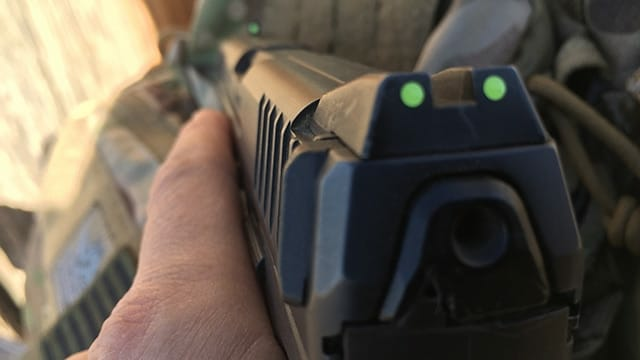 But, there’s never a question as to which is the front sight, as there can be with tritium sights that are all the same color. The steel mags feed well. They do, perhaps once or twice in a 200-round training session, jumble rounds when a partially full mag is dropped on hard ground. To those who’d say this is bad training, I’ll say I agree in principle, however there are a few tests that demand dumping a partially full mag. The misplaced follower has always snapped back into action without issue, but the mags do show this flaw when some others (okay, Glock mags) only do so on rare occasions. A quick mag fix after being dropped is forgivable in my book, but the price of these things is not. VP9 mags are usually sold in the mid-$40s. With shipping and/or tax, the price approaches $50 or more. When I can purchase nearly identical, albeit 18-round mags for my Canik for less than $35, it’s a little painful to part with Ulysses S. Grant for a 15-rounder. It’s still one of the best triggers in the striker-fired market. But the competition is getting better, and HK would do well to refine this one even more. Through the painstaking slow fire segments of The Humbler drill, I’ve discovered a trait this trigger may have developed with time, or perhaps it’s always been there and the drill slowed me down enough to feel it. At the wall, there’s a palpable, but minor click and a thread’s breadth of travel before the actual break. It’s minor, but irritating when shooting for precision. It’d be a mistake to have anything but praise for the humans at the HK USA office, based on my experience. Though something that should’ve lasted longer didn’t, my phone call was answered by a live and helpful person, who connected me to someone who could solve my problem, and did—send the offending parts in, she said, and within a day’s time I’d have the replacement ones in hand. They did as promised. I sent the parts on a Monday, and replacements were in hand on Friday, free of charge. Happy as I am to crow about this pleasing encounter, the speed with which it was done makes me a bit suspicious that my parts issue might be common, because the . . .
. . . in a $700, striker fired pistol should hold up longer than 3,000 rounds. Sure, it’s the recommended mileage for considering replacement on a 1911. But the VP9’s not only quit at around 3,000 after putting in some uncharacteristically inaccurate rounds downrange, it “exploded” rather dramatically upon disassembly. Off into the weeds, lost forever is what I now realize is one of its washer-like ends. The rod itself appeared to be polymer, and inherently flimsy. From what I can gather, HK has since replaced those polymer guide rods with steel ones—the replacement I was sent is steel. I can’t complain at the price, which was a few bucks to ship what remained of the original back. 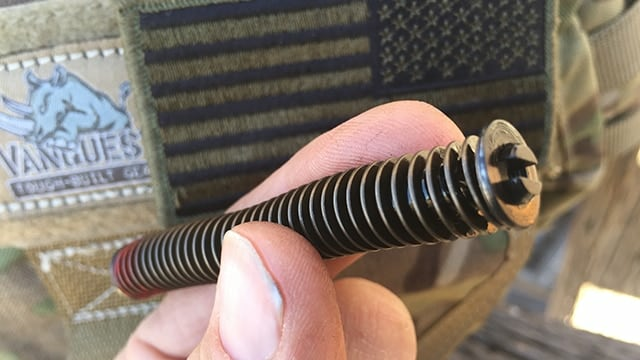 But a company with HK’s track record surely knows the importance of a sturdy recoil assembly, and at the high price point, shouldn’t be cutting corners. Thanks to ergonomics and good stock trigger, the VP9 retains its place as my second-favorite range gun. My confidence is bolstered by HK’s silent admission that polymer guide rods were a mistake. Furthermore, the VP9 enjoys universal positive regard from the several instructors I’ve taken classes from in recent years, as well as being the favorite of a friend who’s a gunsmith and professional operator. These well-versed opinions, and the enjoyable ease of shooting the VP9, help me remain a fan despite its few drawbacks.